Here is our basic test configuration for the drive. We also wanted to test the WD100EFAX WD Red 10TB solution against this WD100EMAZ WD white label 10TB solution. Both have the same Firmware versions and same rotational speeds. We wanted to see how closely they performed. Next, we started running benchmarks and began with CrystalDiskMark, for a quick check on the disks. Both disks are relatively close in this test. Certainly within a testing margin. 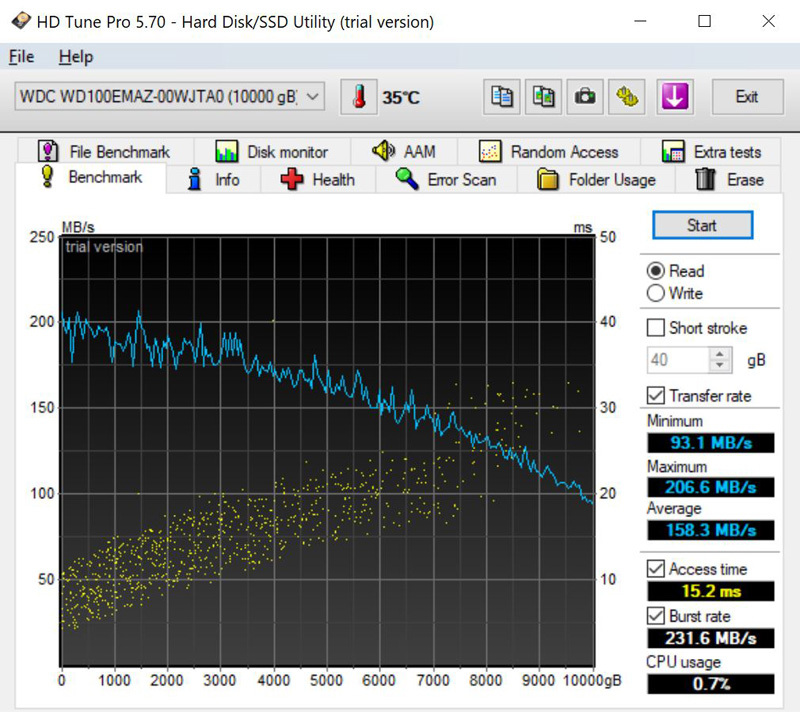 ATTO may not be the most popular benchmark for SSDs, but it shows sequential reads and writes which are the primary use case for hard drives. 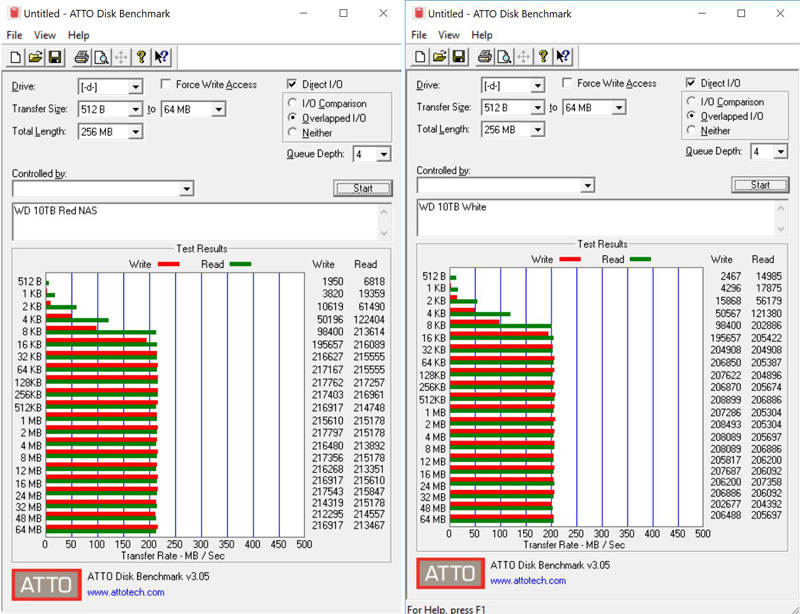 With ATTO we also see both drives are relatively close in performance. 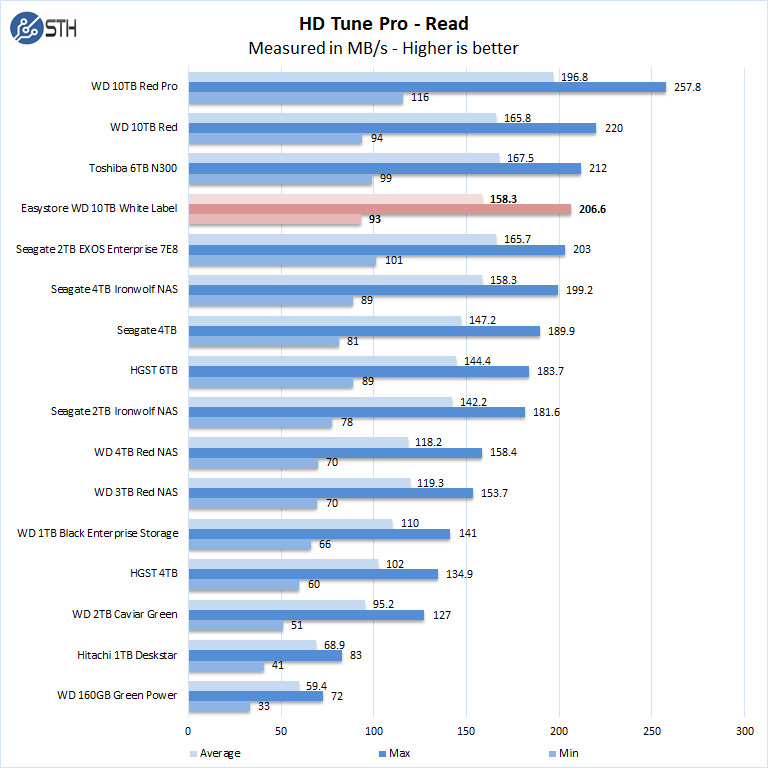 There is a slight performance edge to the 10TB Red HDD, but the WD100EMAZ “white label” drive is relatively close in performance. 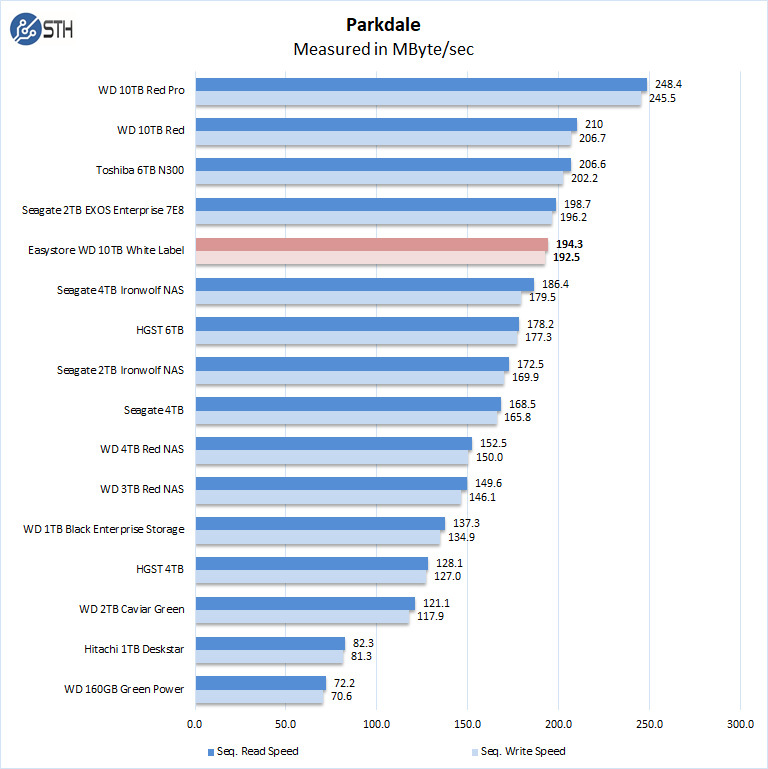 Parkdale is a fast benchmark which reports Sequential Read and Write performance numbers. 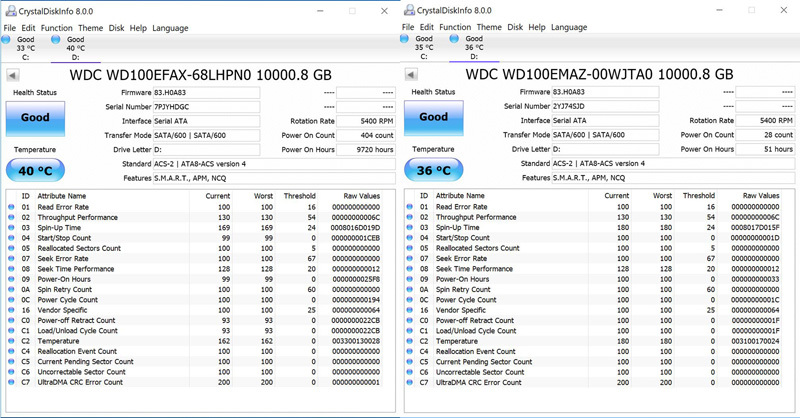 Parkdale shows the WD 10TB White drive to be approximately 10 MB/s slower than the 10TB Red NAS drives. We are starting to see a trend in our results. 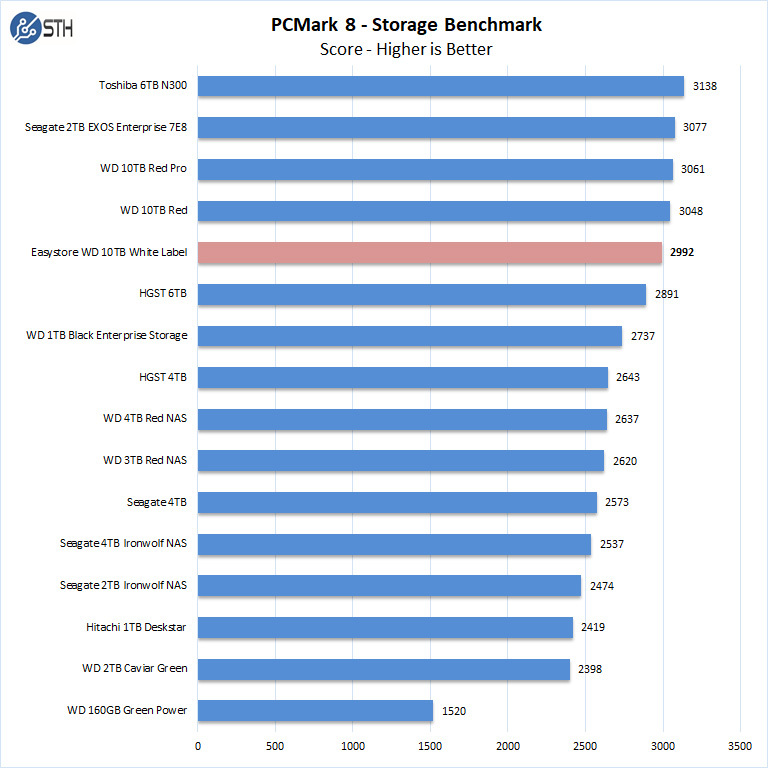 PCMark 8 Storage Benchmark runs several applications and generates an overall score for the drive. 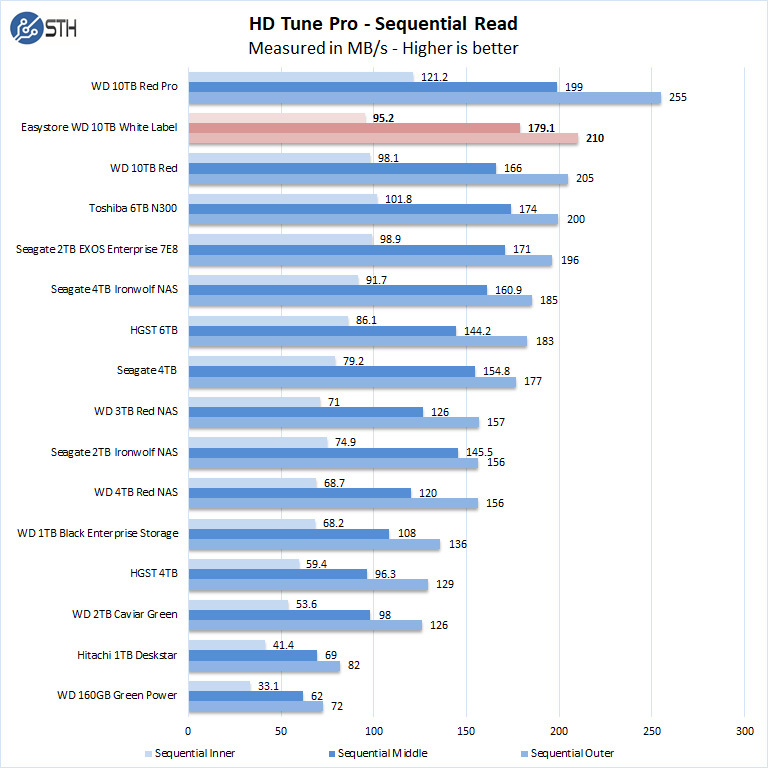 Here again, we see the WD 10TB Red WD100EMAZ is slightly slower than the WD100EFAX “WD Red” 10TB offering. The results are close, but there is a trend. 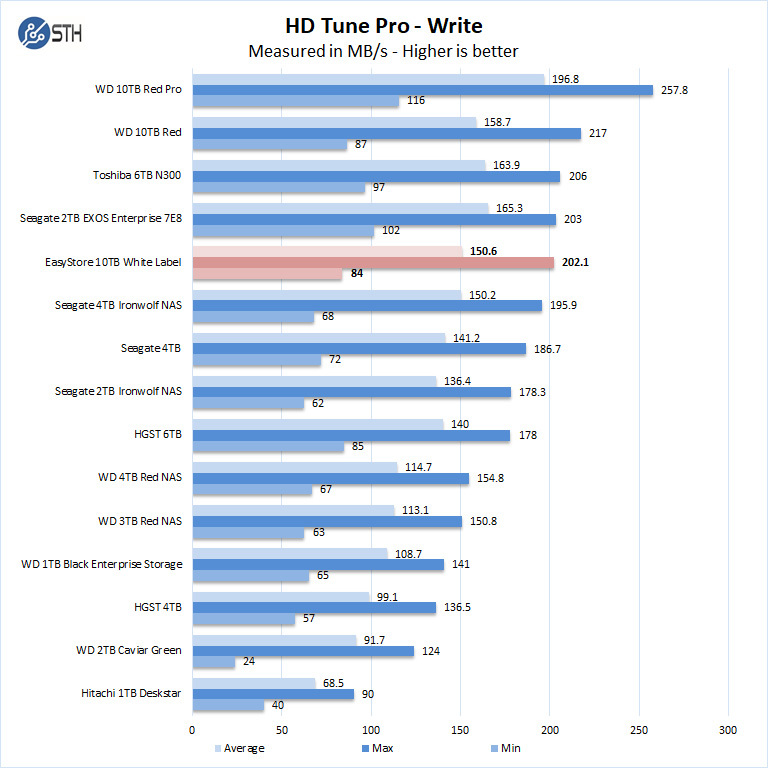 HD Tune Pro can run several benchmarks on your drives; we unlocked the Pro version to give access to all benchmarks. Again, we see a trend where the WD Red 10TB (WD100EFAX) is slightly faster than the Easystore derived white label WD WD100EMAZ. AIDA64 has become a popular test suite, and so we wanted to run it with the drives. 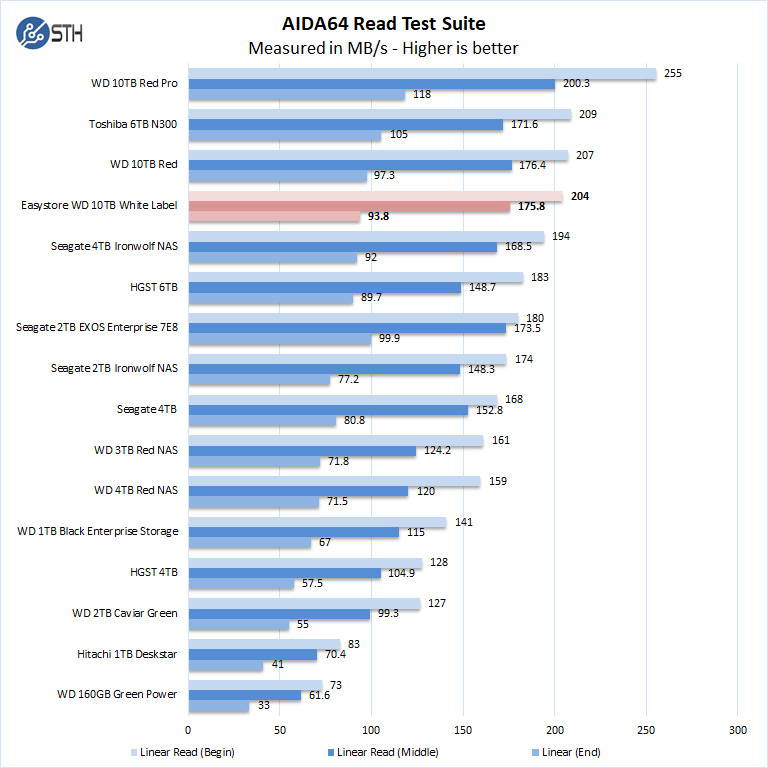 It shows the difference between reading and writing at different radius points on a hard drive which show drastically different performance. 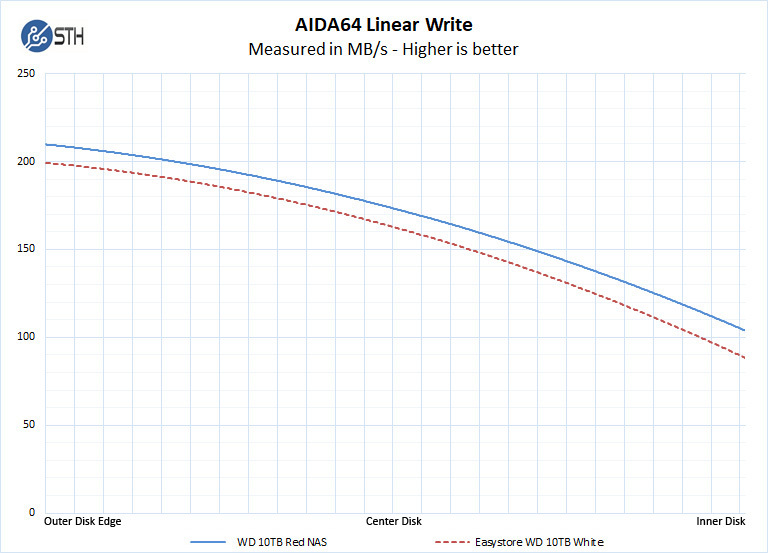 AIDA64 Linear Write test is an extensive benchmark that takes a substantial amount of time to complete, with the 10TB drives this benchmark took almost two full days to run for each disk. Data from this benchmark can be saved to an Excel file and plotted which we did for both the 10TB Red NAS and the 10TB White Label drives. 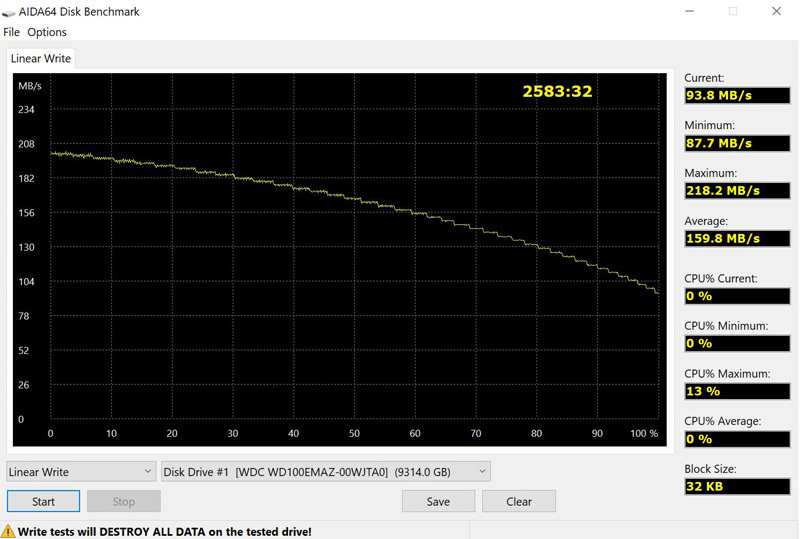 Both drives are relativity close and range about 8 MB/s difference in sequential write bandwidth. There is a clear trend that the WD Easystore WD100EMAZ white label drive is slightly slower than a genuine WD Red WD100EFAX 10TB drive. Next, we are going to discuss the drive temperatures along with giving our final words. We test the WD WD100EMAZ from the WD easystore 10TB external backup drive solution against the WD100EFAX (WD Red 10TB) to see how they differ, and the value both options offer. We were slightly surprised at the results we saw. I like that a big site actually did this. Good to know there’s a difference even if it’s small. I did this with the MyBook 8TB drives 2 years ago and put them in my OMV Nas. 6 months later one totally died. At that point I got a IronWolf drive as a replacement to have some differentiation. The other MyBook drive has been chugging along for the last 2,5 years though. I got 6 of the 8TB version about a year ago. Of the 3 that I’ve pulled so far, all are the WD80EFZX. One is being used as purchased and the other 2 are waiting to be opened probably, once I figure out my longer term NAS setup. My 2 cents – get a good power supply like a Seasonic Gold or Titanium if you’re having problems with drive failures. My combination of 40 plus various Seagates, WD, and Toshiba have never experienced a drive failure. Drives do fail of course, but clean power is important. I just got two of the 8TB yesterday they were both the EFZX, even between the two one was about 5-10MB/s faster when I did a 4 hour burn-in. Neither had any 3.3v issues in my system. One was straight to the MB the other was in a 3 disk hot-swap enclosure I got off of Amazon. I have a question, WHY can’t these drives be set up so that there is a DUEL storage system. Like you write to you D: Drive and it automatically copies the data that you just wrote to THIS 10Tdrive? –you have a double backup of your data? ONE on your principal drive and on the 10 T drive. With all of this space, you can then keep a separate BACKUP of data every month! BUT the duel back up happens immediately? everyday! every time you access your hard drive. AJ, if you want redundancy, I use a Drobo 5N2. 5 bays and you can set them up to be redundant against 1 HD failure or Dual HD failure. But note that dual redundancy really eats up drive space. I’m currently running 44 TB worth of drives (2-10s and 3-8s) and have 31 TB available with standard redundancy and 22 TB with dual redundancy. But since I have almost 1200 movies, over 80 complete tv series, over 6000 albums and some photography work on it, dual redundancy is just the thing for me. I would hate to loose that stuff.